During the period when the skating rink was in disagreement about whether to repair or demolish the building, Marge was one of the first to let her name stand and was nominated Secretary in 1978, a position which she still holds to this day. After quitting the Town Office, she was hired at the Park Administration Office at Wasagaming. After two years, she decided to give her time to her family, the sports which she loves and became involved in community fund-raising groups. Their son, Allan John, who attended Erickson Collegiate, is now taking a welding course in Brandon and hopes to get papers in pressure welding and work with the C.N. like his dad. Dale Michael is an active sixth grader and would like to be in everything going - especially sports. In 1901, Peter Gronback of Bronno, Helgeland, Norway, came to Danvers where he planned to find land, get settled, and send for his wife, Isabella, and children, Jens, Edward, Bertha, and Paul. Peter stayed with his half-brother, Edward Hansen, who lived on N.W. 1/4 17. Apparently, many people found lodging at Edward's until they found a place to settle. Peter and Edward had a sister, Angelina Gronback. She married Mr. Olson. They lived north of Ditch Lake and raised a large family. They moved to the United States before 1906. The only one we knew from the family was Jenny. She married Mason Jones from Cleveland, Oklahoma, U.S.A. Mason owned oil wells. They had one daughter, Emma. They would visit relatives every few years. The farm was Jenny's for many years. Peter homesteaded on Section 30-1S-1SW. Lake Gertrude, known as Ditch Lake, is on part of his land and as his life's work in Norway was a fisherman, he chose to be near a lake where he could fish. His family joined him two years later. He made his house out of logs cut by himself, made his own fish nets, built boats, and made a butter churn by hollowing out a large log. The butter churn is still in existence. He also made small sailboats, one of which was placed over the fireplace in the Museum at Clear Lake and stayed there many years. Grandpa Peter had oxen as means of transportation, for hauling wood, and clearing and tilling the land until horses could be afforded. The only other means of transportation was walking. The closest grocery store was in Scandinavia, to which Paul walked many times and sometimes only for chewing tobacco for his father. Many times the weather was much too cold for the apparel he wore. Peter's nephew, Albin Edwardson, came out from Norway as well. He settled on the S.W. of 32. He was a bachelor, and he died in 1925. Paul, the youngest, received his education at Tales School. He managed a Grade 4 education, as too many times were spent playing hookey and sailing his sail boat that his father built for him. The other three children received education in Norway. Bertha (Petra). (refer to Lee, Ole and Bertha). Jens moved to the United States. He never married, and he died in the 50's. 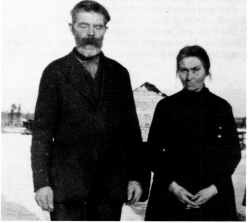 Edward went to western Canada and married a widow, Wilhelmina Litke, of German Descent. She had nine children -- one of them being our mother. They had one daughter, Thelma. Edward died at an early age. Our father, Paul. After school, he worked helping his father on the farm. When he was of age, he joined the army, First World War, February 13, 1918. He trained at the Sar C Camp in Calgary. He went to visit his brother in Stoney Plain where he met and fell in love with Elena, his brother's step-daughter. He later married her. Elena was employed at an overall factory at that time. They made their home on Paul's father's farm as grandpa needed help. Grandpa built them a house. They had five daughters, Ethylin, Doris, Violet, Annie, and Lyla. Dad bought the N .E. 1/4 from Peter Berg and also the land across the lake which belonged to Mr. Rassmuson. Our mother loved to grow things. She always had big bountiful gardens and a big beautiful flower garden. She sewed all our clothing and even did some carpenter work. In the later years, she made sewing her career. She taught her grandsons how to trap, skin and stretch muskrats. Our whole family worshipped at Bethel Lutheran Church, Danvers. It was there we received our religious training. Our Grandparents were charter members of the church. Grandfather died on December 13, 1933, and Grandmother died in August, 1935. In the later years, Dad worked for Good Roads, and then he, mother, and Lyla moved to Carberry in 1950 where he was self-employed with the Watkins Company. Mother died on May 5, 1955, and was buried at Bethel Cemetery.